Saintly samurai: Takayama Ukon abandoned his status to devote himself to his Christian faith and he died in Manila with a reputation for holiness. 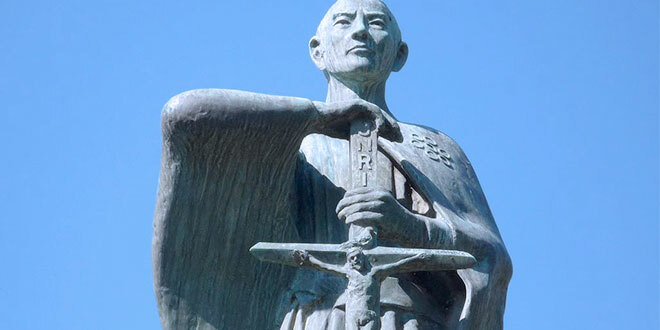 Takayama Ukon was be beatified on February 7. Marist Father Paul Glynn shares some history from his amazing life. ST Francis Xavier strode manfully from a small boat into feudal Japan on the feast of Mary’s Assumption, August 15, 1549, the day he had taken his vows as a Jesuit. There was no semblance of a dictionary that translated Japanese words and ideographs into Roman letters. Trying to get Japanese words to express Christian concepts was a huge task, but Xavier’s sheer holiness won him some very important Japanese converts. One was a physically handicapped musician who had been making a living by travelling around towns playing his lute and reciting old folk stories. This eloquent wandering minstrel was baptised by Fr Xavier and eventually became the able catechist Jesuit Brother Rorenzo. On one occasion Br Rorenzo spent several whole, uninterrupted days arguing, counter arguing, evangelising and finally converting a “Daimyo” – the Japanese title for a feudal lord. This minor Daimyo Takayama Dario lived in a small castle in Nara Prefecture. In 1563, Br Rorenzo had the joy of accompanying Fr Vilela to the castle for the baptism of the whole Takayama family, including eldest son Takayama Ukon, then 11 years old. It was 1563; Takayama Ukon would become a great and famous Daimyo early in his adult life, and would end up living in grand stone castles commanding extensive holdings in what is today Kobe City. He would lead many to baptism – aristocrats, samurai, farming folk and town dwellers. The Jesuits wrote enthusiastic letters back to Europe about this Takayama Ukon, letters also expressing great hopes for the future of the small but quickly spreading communities of Japanese Christians. Fr Xavier had earlier written to Jesuit headquarters in Rome describing the Japanese as a highly cultured people, predicting they would become great Christians. But then disaster struck, initiated by the lies and boasts of the Spanish captain of the ship San Felipe. On its voyage from the Philippines to Mexico it ran into a roaring cyclone that tore off the masts and sails and dumped it on the Japanese coast – with most of the cargo and crew intact. By Japanese custom the local Daimyo looked after the crew, but the cargo was his. When the ship’s captain was told this he responded with a lie and a threat. This threat was relayed to Shogun Hideyoshi, the generalissimo and real ruler of Japan – the Emperor was a powerful symbol, eking out cultured boredom in a gilded cage in Kyoto. The Shogun looked apprehensively at the Philippines and Mexico, and the seemingly unstoppable armies from Europe. This set the scene for the persecution of Christians in Japan. The Shogun waited because he wanted to continue trade with Europeans via their ships. But early in 1597 he struck a fierce blow – a total ban on Japanese Christian and western missionaries. He had risen to prominence from humble beginnings by ruthless violence. He now decided to terrorise every Japanese Christian and foreign missionary by public and gruesome executions in Nagasaki, where Christians were numerous. Famous Christian Daimyo Takayama would head the list of about 20 missionaries and Japanese Christians to be executed. These “criminals” would have ears sliced off, loaded into open carts and paraded around the capital city Kyoto. Then guarded by unmerciful samurai they would be forced to march to Nagasaki, 30 days away, during the coldest time of the year. There they would be fastened to crosses in mockery of this foreign Christian religion. The local governor was ordered to make as many citizens as possible attend. Everything was to be unhurried and drawn out, to heighten the terror for both the crucified and the onlookers. Finally the two samurai, who had been standing right under each of the crucified, with the steel tip of a lance very visible, would thrust the lance deep and up under the rib cage of the crucified. The last punishment was the refusal of burial for their corpse that would remain on the crosses until they rotted away. The Shogun’s advisors did not oppose the gory executions but they advised the Shogun that Daimyo Takayama was too highly respected, famous throughout Japan as a man of great courage and ability, and a lover of the highest expressions of Japanese culture – the Way of the classical Tea Ceremony, Haiku poetry, fine calligraphy – and a brilliant designer of Daimyo castles. The advisors dared not raise with lecherous Hideyoshi another reason for Takayama’s fame – his total faithfulness to his wife Justa Kuroda, in an era of sexual abandon among the powerful men of the land. His advisors suggested that crucifying Daimyo Takayama like a common criminal could cause dangerous resentment and possibly harm to the Shogun’s “great reputation”. So Shogun Hideyoshi took Takayama off the list of those to be executed on February 6, 1597. However the merciless Shogun was angry that Takayama still lived publically as a Christian, despite the Shogun outlawing Christianity. To backtrack some years, Sen no Rikyu, still venerated by most Japanese, was the acknowledged creator of the fully developed Japanese Tea Ceremony, “Chado”, The Way of Tea, which was fast becoming the quintessence of Japanese refinement and culture for the ruling classes. The Tea Ceremony is not like a casual cup of tea with friends. The Tea Ceremony is conducted mostly in silence, taking an hour or more, and is acted out according to a solemn ritual full of spiritual symbols. Often when Japanese Tea Ceremony people attend Mass for the first time they will say the Mass reminded them of their much loved Tea discipline. This famous and venerated Sen no Rikyu had publically named the young Daimyo Takayama Ukon as one of his seven “mana deshi” – “most beloved disciple” – among the many Japanese who now practised the Tea cultural expression he created. Shogun Hideyoshi, who was also a follower of this Way of Tea, of course knew Sen no Kikyu personally. He called Rokyu to his castle, and ordered him to visit Takayama with this stern warning. The consequences the Shogun referred to was the duty of hara kiri (seppuku), the ritualistic disembowelling of oneself with a short sword. Samurai history up to the Emperor Meiji era that began in 1868 has many famous examples of hara kiri as “atonement” for breaking the bushido vow of obedience to one’s liege lord. So the Shogun was telling Takayama to reject Christianity or commit hari kiri. If Takayama died by hari kiri there would be no backlash against the Shogun. Sen no Rikyu had no alternative but deliver the Shogun’s orders. To crafty Hideyoshi the spirited Daimyo Takayama replied immediately and masterfully, neither rejecting bushido nor his Christian faith: “I accept Shogun Hideyoshi as my liege lord on this earth. But, higher than my earthly bushido obligation is my totally absolute obligation to obey Jesus, my Divine liege Lord, the Heavenly liege Lord of all earthly lords. I cannot renounce Him from whom I have received life itself, and the promise of eternal salvation.” Sen no Rikyu made no effort to persuade his Way of Tea disciple to renounce Christ. He later whispered to another Tea disciple that Daimyo Takayama had not betrayed the samurai code, nor the highest ideals of Chado, the Way of Tea. Probably this refusal of Sen no Rikyu to urge obedience to the Shogun was one of the reasons why the Shogun ordered Sen no Rikyu to commit hara kiri, four years later in 1591. The heroic Chado leader obeyed his liege lord Hideyoshi, called close Tea friends to a final Tea Ceremony, handed them his Tea utensils as keepsakes, bowed peacefully, and left them to commit hara kiri alone – to the immense chagrin of all noble-minded Japanese from that year right down to the present day. When Shogun Hideyoshi received Takayama’s reply from Sen no Rikyu he was infuriated. He ordered the immediate seizure of Takayama, his castle, lands and all his possessions, reducing him to the ignominious, lowest rank of a samurai, masterless “ronin”, whom no Daimyo could employ or shelter. Takayama, his wife and family were banished to an inhospitable area of Kanazawa in the present day Ishikawa Prefecture. Homeless ex-Daimyo Takayama first went to the Jesuit house at Arie, asking to be allowed to do a week’s retreat based on St Ignatius Loyola’s Spiritual Exercises. Takayama was a great admirer of St Ignatius who once was a knight, filled with love for chivalrous tales of knights who saved fair princesses. The converted Ignatius chose poverty to follow Christ. Samurai Takayama told his wife and family that they now had the opportunity to do the same for Christ. Fortified by the Ignatian retreat, and at peace, Takayama asked for the prayers of the Jesuits and then led his family to what became a hand-to-mouth existence in a hostile environment. However as soon as he arrived there he began a fearless and free life of spreading knowledge and love of the now outlawed Christ of the Gospels. Shogun Hideyoshi died the next year, 1598. Brilliant military strategist Daimyo Tokugawa leyasu, determined to become the new Shogun, waged a series of battles to the death of all rivals. He destroyed the last of them at Sekigahara in the year 1600 and became the Shogun. He wanted to unite the whole war-torn land by declaring Shinto the religion all must follow. After consolidating his position he re-issued the ban on Christianity and began a merciless war against Christians in 1614. He knew ex-Daimyo Takayama was spreading Christianity in the provinces and sent a grim message to him. Takayama ignored it. Some new friends advised Takayama to save himself and his family by a “seeming” obedience to Tokugawa’s order. Shogun Tokugawa then sent samurai to arrest Takayama and bring him bound to Kyoto. There Tokugawa worked on still famous Takayama for seven months, alternating between enticements of rewards and savage death threats. Takayama remained rock solid for Christ. On November 8, Takayama, his wife Justa Kuroda, their daughter and their five grandchildren, 350 missionaries and Japanese Christian laymen were put on a small boat and deported to Manila. By now Takayama’s body was broken. Forty days after arriving in the Philippines he died during the night of February 5, 1614. On February 7, 2017, the Archbishop of Osaka will celebrate a Mass in his cathedral, representing the Holy Father, and name Takayama Ukon among the ranks of the “Blessed”. Fr Paul Glynn, author of A Song for Nagasaki, published in 13 languages and which is the basis of the movie ‘All that remains’ which is available on DVD from Amazon. All profits from Fr Glynn’s six books and the movie go to impoverished people, especially in the Philippines. A Marist priest and native of Australia, Fr Glynn attended St Peter Chanel Seminary, near Sydney, and was ordained in 1953. He spent 25 years as a missionary in Japan.